Slice the onion and fry until soft with the garlic. Stir in the rice and the wine. Cook for a couple of minutes until the rice ‘cracks’. Slowly add the warm vegetable stock, stirring all the time. Add more little by little as it absorbs. 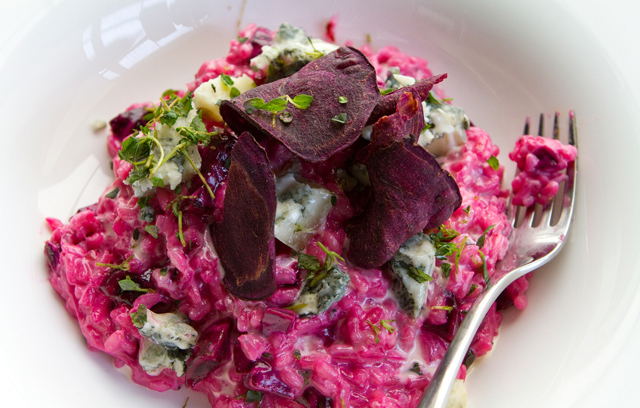 When the risotto is just cooked but still has a bit of bite, add the chopped, cooked beets with their juice. Then stir in the cream and thyme. Fold in the gorgonzola cheese. Serve in a big bowl so everyone can help themselves. Finally, garnish with beetroot crisps, gorgonzola and double cream. 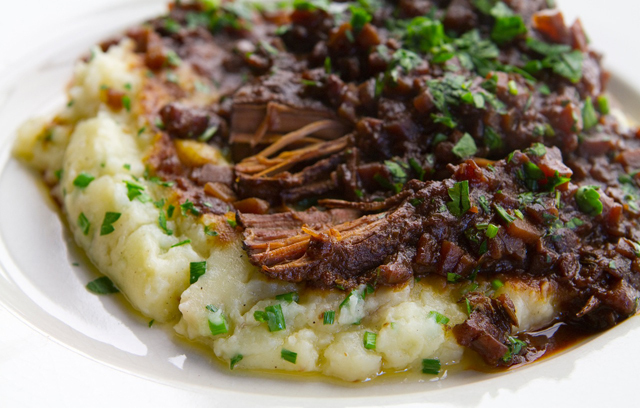 Simon’s beef brisket and mash is a hearty, winter warming stew, which is perfect for a relaxed weekend meal. Brisket is an inexpensive but tough cut, which needs to be cooked ‘low and slow’ to bring out the best in the meat. Simon recommends cooking the brisket for at least three hours so the meat is falling apart. Trim the beef and seal on all sides. Cook the onions, carrots and celery in beef fat for 12 minutes. Add the garlic, then cook for another 2 minutes. Add the tomato purée and cook out for 4 minutes. Stir in the cayenne, sugar, paprika and cook for another 4 minutes. Pour in the beef stock, red wine, brandy, vinegar, thyme and bay leaves. Bring to the boil and cook for 2 minutes. Add the beef back to the pot, cover and cook for at least 3 hours, or up to 6. To make the mash, heat up the potato, beat in the butter and season well. Stir in the mustard and chives. Serve the beef with mash on the side. This entry was posted in Daily Brunch, Talking Ocado and tagged Beetroot risotto, blue cheese risotto, brisket, Channel 4, Cook, Cooking, cooking from scratch, Daily Brunch with Ocado, food, foodie, Global Food, good food, Groceries, home cooking, Ocado, Ocado deliveries, Ocado groceries, Ocado Vouchers, Princess, Recipes, Shopping at Ocado, Simon Rimmer, slow cooking, Tim Lovejoy, TV Chef by Ocado. Bookmark the permalink.